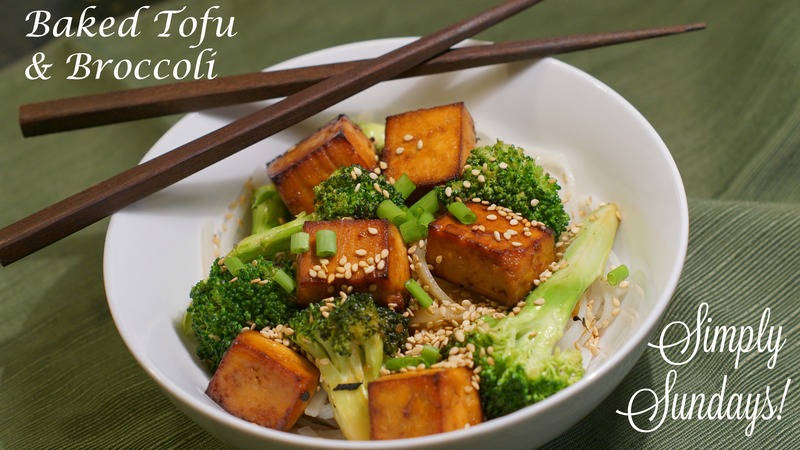 Baked Tofu & Broccoli – Simply Sundays! Even those of us who are not vegetarian need a break from meat or poultry sometimes. What better way to get your protein than tofu! And since it’s a healthy choice, we also like to bake instead of fry. And as far as we’re concerned, it tastes even better baked! I have the extra firm block of tofu and like to drain out as much of the liquid as possible Let’s replace the tofu liquid with a delicious Asian marinade! Cut three large broccoli crowns into florets. I only trim a little off the bottom of each stem because the stems taste good too! Heat 2 tablespoons of coconut oil in a pan on high heat and add in the broccoli florets Saute about 5 minutes and add in 1/2 cup of water to steam the broccoli. Saute another 5 minutes and add in the reserved marinade. Cut three large broccoli crowns into florets; heat 2 tablespoons of coconut oil in a pan on high heat and add in the broccoli florets Saute about 5 minutes and add in 1/2 cup of water to steam the broccoli. Saute another 5 minutes and add in the reserved marinade. I made beef and broccoli tonight! I’m going to link up to this once I post. Great recipe! Yummy as always.